The scaremongering continues, however this just exposes the failure of the alarmist’s alarming agenda about Australia’s Great Barrier Reef. Using images from Samoa? When I was looking just now at how recent were the NOAA figures from Mauna Loa, I found that they included April this year, which wasn’t too bad, considering that it is public servants who put the figures up. I can think of no good reason why the May figures are not yet up but I suppose not enough coffee and cake has so far been consumed for that to happen. But back to the figures we have: There was a LEAP in CO2 levels this year. Where December 2015 ended up on an average of 401.85 ppm, April averaged 407.42. That’s twice as big as most annual increases. So, on Warmist theory, temperatures should have leaped too over that same period. You know what I am going to say: They in fact remained absolutely flat. GISS shows a January temperature anomaly of 1.11 degrees Celsius and April shows an anomaly of exactly the same! You couldn’t make it up! And you have to laugh at how futile have been the the vast efforts to reduce CO2 levels. They just go up and up regardless. Maybe we should all stop breathing. Warmists would like that. They are, after all, anthropophobes. 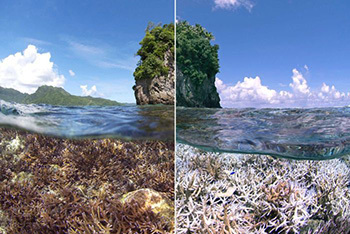 This entry was posted in Climate, comedy, Environment, Oz politics, science, weather and tagged carbon emissions., climate science, Dr Jamie Oliver, environment, government, great barrier reef, Great Barrier Reef Marine Park Authority, Joanne Nova, Oz politics, research, russell reichelt, science, terry hughes, trove, weather. Bookmark the permalink.